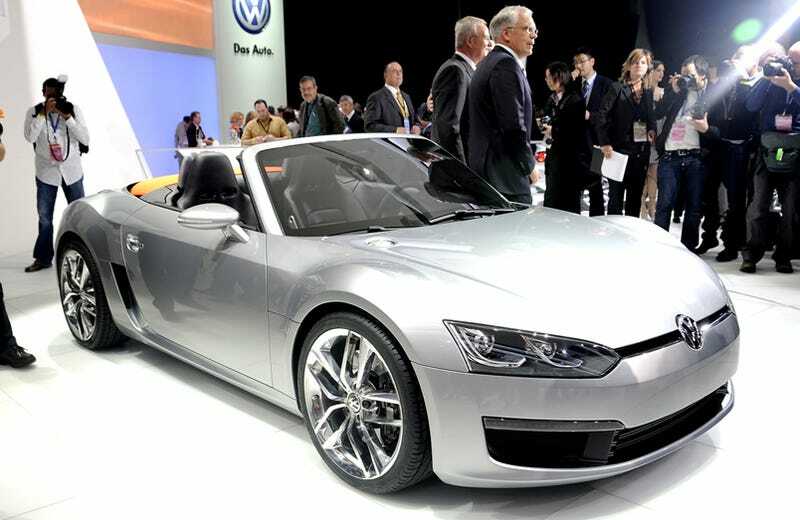 The VW Bluesport Roadster may only be a concept, but it's sure to pique the interest of drivers looking for top-down fun and diesel power on the same chassis. As we mentioned last night, the Volkswagen Bluesport concept is powered by a 180 HP turbodiesel motor mounted amidship. Despite its concept status, VW is promising fairly realistic performance. This includes a 0-60 MPH time of 6.2 seconds and a top speed of 140 MPH. Though not Prius-killing, the 42 MPG combined mileage (we're guessing in the European cycle) is impressive for a sports car and would surely top any known competitors. As for production, there's no definite word though the design looks closer to a production vehicle than most we've seen. The highlight of the VW press conference? Listening to President and CEO of Volkswagen of America Stefan Jacoby pronounce Chatanooga was high on the list. But the breakdancers who introduced the car, followed by the dozens of carnation-wielding kids, take the cake.